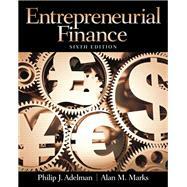 by Adelman, Philip J.; Marks, Alan M.
For many, starting a business can be an overwhelming experience. Understanding the financial aspects of running a business can be even more daunting. Entrepreneurial Finance, Sixth Edition was written to help a broad range of U.S. business owners understand the financial aspects of entrepreneurship. Unlike traditional corporate finance books, this text explains the financial topics most important to running a profitable small business suchasinventory control, time value of money, working capital management, and forecasting. Updated to reflect recent economic trends, this edition also shows how two popular business tools (excel and TI BA II Plus calculator) can assist business owners in problem-solving and decision-making. Tackles the financial aspects of business entrepreneurship—from business planning to inventory control, to time value of money, to working capital management, to forecasting and financial planning for both the entrepreneur and the business. Provides critical background knowledge—by presenting basic economic and financial concepts early in the text. Explains the different types of small businesses—by examining the financial statements for Sole Proprietorships, Partnerships, LLCs and Corporations. Explains all six time value of money formulas—and their application in both personal financial planning and business financial planning. Offers a glimpse at real small businesses—using short end-of-chapter case studies. Shows how to solve sample problems—using excel and the Texas Instruments BAII Plus calculator. Includes time value of money tables—see Appendix B.